Cupcakes and ATM’s, two words not typically associated with each other in a sentence and definitely not as a thing. But it is and it is delivering an assortment of moist morsels satisfying sugary cravings any time – day or night. There you are. It is 2 a.m. and you have a killer craving for cake. But here is the problem, you don’t want to make it. It’s 2 a.m., you don’t want to make a bunch of dirty dishes that you have to wash. Then you have to wait for the cupcakes to bake – providing, of course, that you have all the ingredients and you have the paper cups. If you don’t, well, then you have to make a trip to the store at 2 a.m. because this craving must be satisfied. So there I was, standing in front of a pink ATM tucked in the side of a building. OK in all honesty, I did not have a craving. I was walking by on the street and saw the cupcake ATM sign and said, “whaaat?? This is crazy! So crazy I have to try it!” More honesty, it was not 2 a.m. but a sensible 3 in the afternoon so I could have a pre-snack before dinner. Everyone knows – life is short, have dessert first. Back to this crazy ATM. I am standing there looking at this ATM with Sprinkles Cupcake ATM written on it. How can they deliver cupcakes in it? I am imagining vending machines with rows of metal spirals that hold small bags of chips, peanut flavored crackers that taste like cardboard, candy bars and things like that. You drop some coins in the coin slot and watch the spiral spin pushing out your processed snack selection, hoping it does not get stuck because then you are left with a dilemma. Do you walk away or do you pound on the side of the machine hoping the snack drops? Imagine a cupcake topped with creamy frosting in one of those. The cupcake is pushed down the row by the spiral and then over the edge of the shelf. It hits the viewing window and sticks, slowly sliding down it to plop in the tray at the bottom. Yup, I cringed at that thought too. My curiosity was in overdrive. How does this work? Is there someone on the other side of the wall watching me with a hidden camera like on one of those prank tv shows? 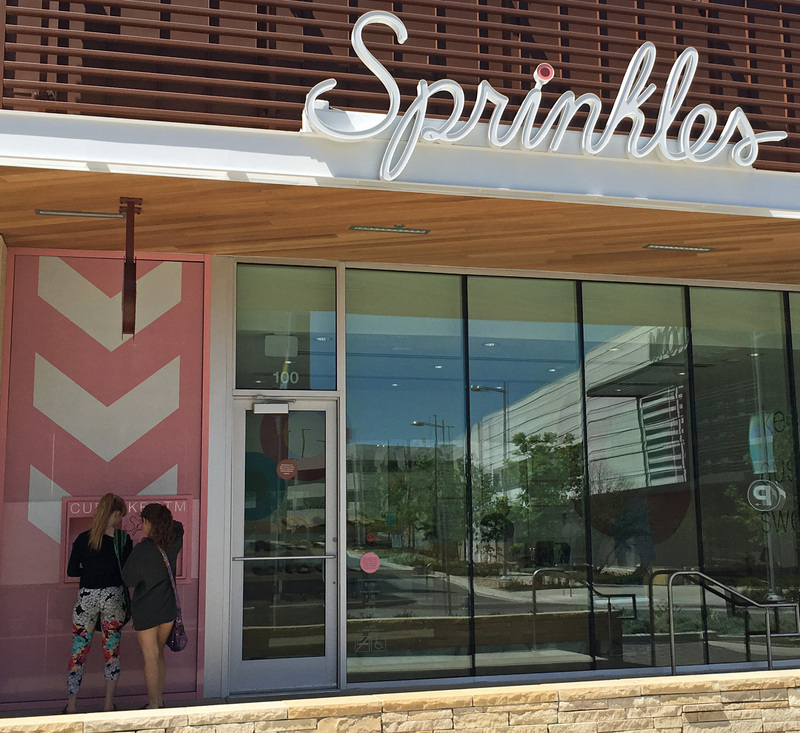 When I place my order will there be a spay of frosting or candy sprinkles is going to come flying out of the wall surprising me. Or is there a tiny little kitchen gnome in the machine that is going to hand me a cupcake. There Was Only One Way To Know. Place an Order. I look around to see if there is anyone suspiciously leaning against the corner of a building reading a paper or a mom attending to a baby in a stroller that has not made a sound. No one was in sight. I touch the computer screen and a musical jingle starts playing saying “I love sprinkles.” It kind of makes me think of Willy Wonka and the Chocolate Factory. A variety of cupcake options pop up – chocolate, gluten free red velvet, lemon meringue, carrot cake among several others. There were also cookies to choose from – chocolate chip, double chocolate, peanut butter or snickerdoodle. I had my eye on the carrot cake. You know, the whole I’m eating vegetables in my cupcake so it has to be healthy thing. Touching the screen, I make my selection. A countdown clock starts giving me the option to change my mind or dig out my credit card. Dig I did. I swiped my card and this small door starts to slide open. There is a small brown cardboard box inside. I look around one more time for that mom or newspaper reader before I collect the box. Low and behold, what’s inside? The carrot cake cupcake that I ordered, in perfect condition none the less. I was quite amazed! No metal spirals pushing the cupcake forward to slide down the front. No mess, just this perfect little morsel of moist delicious carrot cake delivered to me like magic from this pink machine. I looked at it in wonderment and awe. This must be what it was like to watch the very first TV show in 1925 and wonder how did all those people fit in there. Wow, what will they think of next? This is a great age we live in. I stumbled across this little pink deliverer of sweet goodness in Austin, Texas. Austin is known for its weirdness. It takes pride in being a little odd, making people wonder just what might they see around the next corner. So naturally, I thought this was an Austin exclusive, but no. There are 15 cities around the U.S. home to this pink bundle of joy putting smiles on people’s faces and satisfying sweet cravings. Check out their website to see if they are in your city.